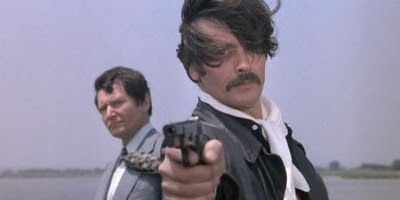 A gallant, gorgeously shot French-Italian crimer from 1975 offers up a solid Alain Delon at his most badass, with some exceptional costuming that includes black leather belts with multiple buckles, one serious ascot, and a surprisingly imposing mustache. Gritty action and seedy locations, authentic gypsy camps, plus the movie's strong characterizations do nothing but support the bad-guys-on-the-run storyline and the determined detectives on their trail. Also notable are the themes of loyalty explored with some maturity here, as Delon struggles with his alliances to the gypsy community and those present, and falling apart, in his own gang. Definitely an improvement over a lot of the genre that chooses to eliminate humor altogether and have its criminal bands be nothing more than raving mad lunatics, mowing down grocery shoppers in between fits of cackling. Good work in the movie's cinematography, especially one incredible beach pan of seagulls to Delon's face. The absence of a music score, except for the perfectly appropriate guitar of Django Rheinhart only increases the vivid tension, plus provides the movie its ethnic flavor. Not overly violent but plenty impactful in its moments of conflict. Delon's henchmen are particularly amusing yet believable criminals. Lead detective Marcel Bozzuffi even gets to smile, this an unthinkable sight in most of the man's roles as an uncompromising sadist. An excellent example of Eurocrime done right.